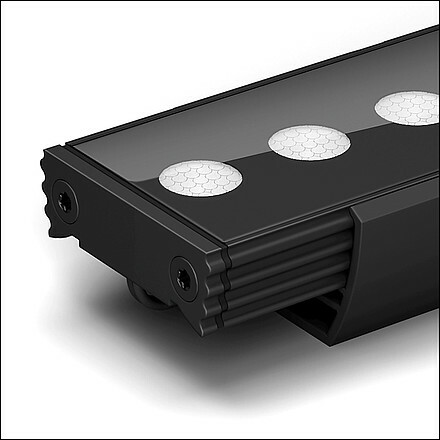 24 V, constant-voltage-operated, linear surface-mounted LED luminaire with nano lenses optics in miniaturized dimension (1.52" x 0.49"). Ideal light distribution for wall grazing thanks to beam angles of 15°/25° and an oval light distribution of 15° x 40°. Homogenous light flux along the fixture and flawless thermal management thanks to constant voltage controlled innovative flexible PCB LED tape, produced in a unique Reel-to-Reel process. 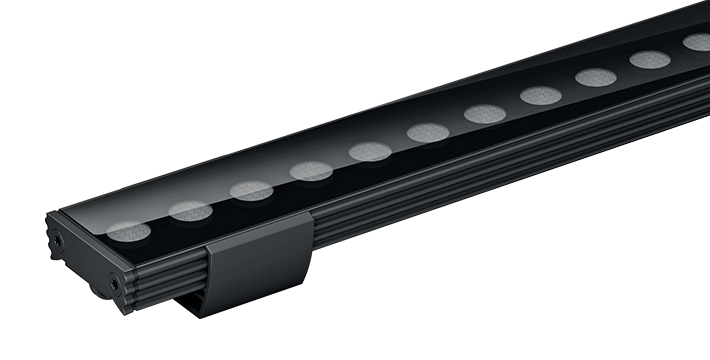 Free scalable luminaire lengths from 0.85' to 3.31'. Easy serial installation with quick connectors. Assembled using state of the art automated Reel to Reel (R2R) production process supporting LED Linear™ Tj Away® thin flexible circuit board technology. In combination with Chip Scale Package LEDs (CSP) a thermal resistivity of 5.33 K/W is achieved for an optimal heat dissipation (junction to profile), which guarantees an outstanding lifetime of > 60,000 hrs L80/B10. Embeds high quality LEDs with 3 step MacAdams (SDCM3) binning centered on target CCT (One Bin Only) with an extended photometric code of Wxxx/339 ensuring an exceptional color consistency over the rated lifetime. Premium color rendition with a CRI of 95 (R9 = 85) and TM-30-15 up to Rf = 95 / Rg = 100 ensuring a remarkable light quality. Consistent light intensity all along the luminaire length is obtained thanks to active current regulation operated by dedicated integrated circuits (ICs) on each step. Protected against electrostatic discharge +/- 2,000 V and polarity miswiring. Fully PWM dimmable for frequency > 0 Hz up to 2 kHz (flicker free for frequency higher then 1.2 kHz according to IEEE P1789 standard). Made in Germany.